How do you use digital tools and techniques to transform a large business with strong principles and thousands of people? Co-op Digital was formed in 2015 to answer that very question across the Co-op businesses. We were appointed its partner on an exciting journey that has already led to some high-impact projects – such as “Shifts”. We knew from the get-go how important it was to find the right problems to solve. To make sure that happened we made a great, early choice: we built a blended team of people from ustwo, Co-op Digital, Co-op Food and other partners. Genuine change has to come from the inside as well as the out – so working together made perfect sense. It also quickly led us to a significant problem to work on – shift and schedule management. 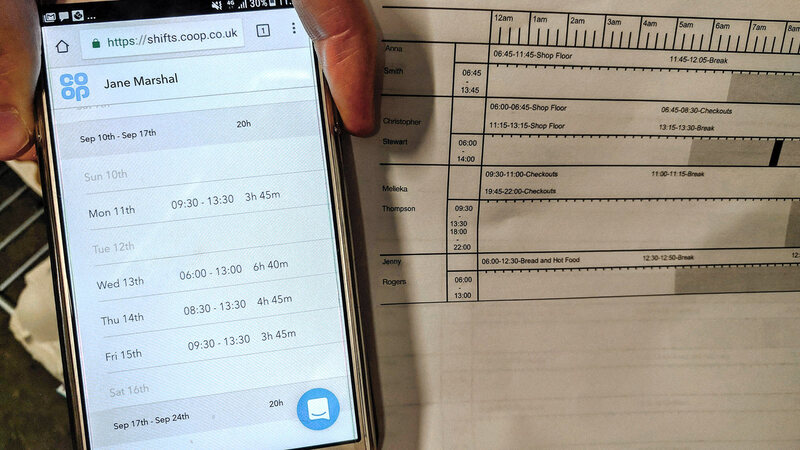 Internal polling told us 40% of Co-op colleagues phoned their manager about their shifts each month, while managers spent large amounts of time arranging cover. This seemed like a great place for us to make a difference to people and deliver efficiencies too. So we got to work making an Alpha of new scheduling tool Shifts. We worked on Shifts in the leanest way possible. We only wrote code to test the things we needed to learn. We got up and running quickly by building Shifts on top of legacy systems. And we started with six stores of varying size, location and shift-swapping practices. As always we worked in the open, regularly sharing our work with the Food and Digital teams, encouraging feedback from anywhere in the business. At every show-and-tell, listening group and workshop we would learn something new that would influence the product for the better. After six months of testing and learning – with over 1.1m user interactions observed along the way – we started on the Beta version. We did this in parallel with the Alpha so we could use live data to design a fully tested and validated product. We then worked closely with fellow agency EqualExperts, Co-op partner to take Shifts from Alpha to production app. What began with six stores of varying size grew by word of mouth to 120 stores and 660 users – and that was just in the Alpha phase. Shifts is has now been implemented across all 4,200 Co-op stores and all 45,000 colleagues in the UK. "It has made managing my team easier. Attendance and timekeeping has improved considerably." Shifts won an incredible three Big Chip Awards, for Best Mobile Application, Best User Experience and the Anthony Wilson Award. 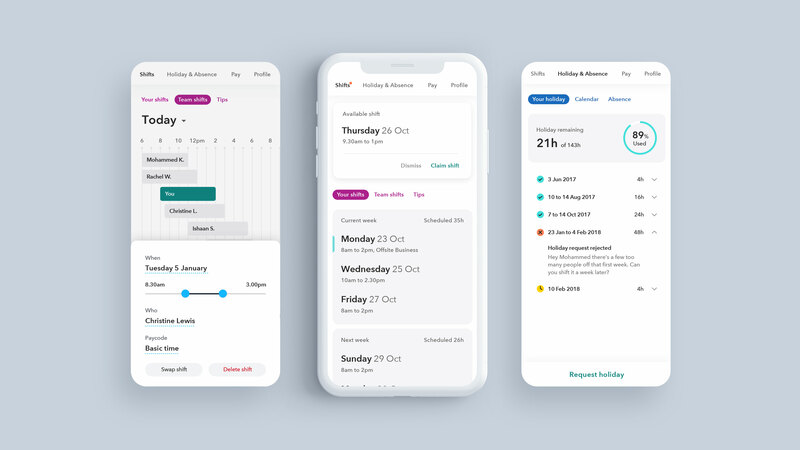 Its impact can easily be seen with an average 90% of users returning at least weekly to check and update their rota.